The Invitation of Dr. Martin Luther King Jr.
Pete Paulsen ’64 recalls that the early 1960s were years of discussion, action, turmoil, and change. 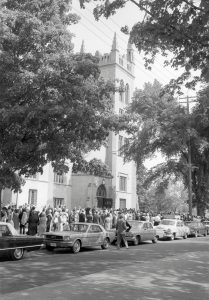 Although Hope College clearly never was a Berkeley, Paulsen admits, all over campus Hope students engaged in passionate discussions about what could and should happen to address the United States’ problem with racism, its movement toward war in Vietnam, and tensions with the Soviet Union. He confesses that his memory might not be as good today as it was when he was a student. However, it appears that his friends are able to recall even less about the courageous step they took when inviting Dr. Martin Luther King Jr. to the campus of Hope College. “Much of this history must of necessity then be conjecture,” Paulsen therefore concludes. One of his friends involved was Roland Marshall ’63, a former classmate of James Sanford. Together, the two students attended Dr. King’s speech at Ohio University during the International Student Conference of Race. Paulsen recalls his friends’ excitement about the dynamic and direct nature of Dr. King’s presentation upon their return to Hope, and the powerful impact this had on him. Paulsen believes that this enthusiasm matched the energy Dr. King generated through his effort to address the issues with American racism. Although Paulsen is unsure about specific details, he recalls having planned an invitation of Dr. King to the campus of Hope College together with several friends. Many students placed an importance on hearing what Dr. King, a pivotal figure in the civil rights movement, had to say, and demonstrating their support of his work. Paulsen is confident that an invitation of Dr. King could not have been realized had it not been for student support and the permission of the college’s administration. Unfortunately, Dr. King was unable to visit the campus. Paulsen does not possess a copy of the initial invitation letter and of Dr. King’s response to this. He vaguely remembers having sent Dr. King another letter asking him to choose a date, and in the summer of 1963, Paulsen received a second letter from Dr. King. This indicated that the first letter had offered a specific date on which Dr. King was unavailable. Paulsen recently gave this letter to Hope’s archives. 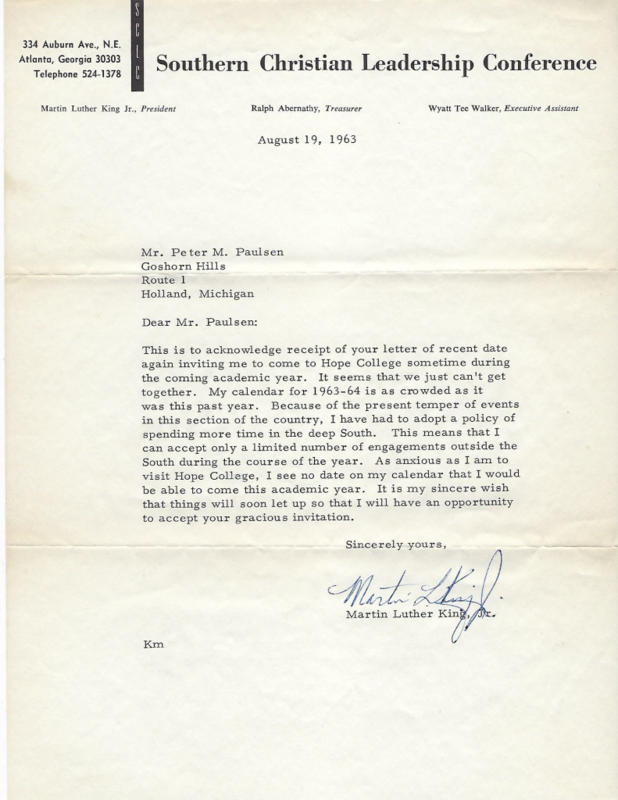 The letter reveals that due to commitments to the Southern Christian Leadership Conference, Dr. King was unable to visit Hope College. Thank you, Paul, for sharing your story and this letter. As we look forward to Martin Luther King, Jr. Day on Monday, January 19, you are welcome to attend a lecture by Dr. Joy DeGruy on campus at 2:00 pm. For more information, please visit hope.edu/calendar. You made an impact on our lives when we moved to Dallas in 1979, and it was wonderful to touch base with you then. Jim and I are still in the Dallas area and would love to hear from you. Your letter from Dr. King is a treasure! Thank you for sharing it. During my years at HOPE (1949-1953), the only African-American student was Leroy Lovelace, from a small town in Alabama. I recall visiting that town years later. I also visited Leroy at the YMCA (rooms to rent) in Chicago years later. And when I learned he had died, I phoned his family in Alabama to express my condolences. 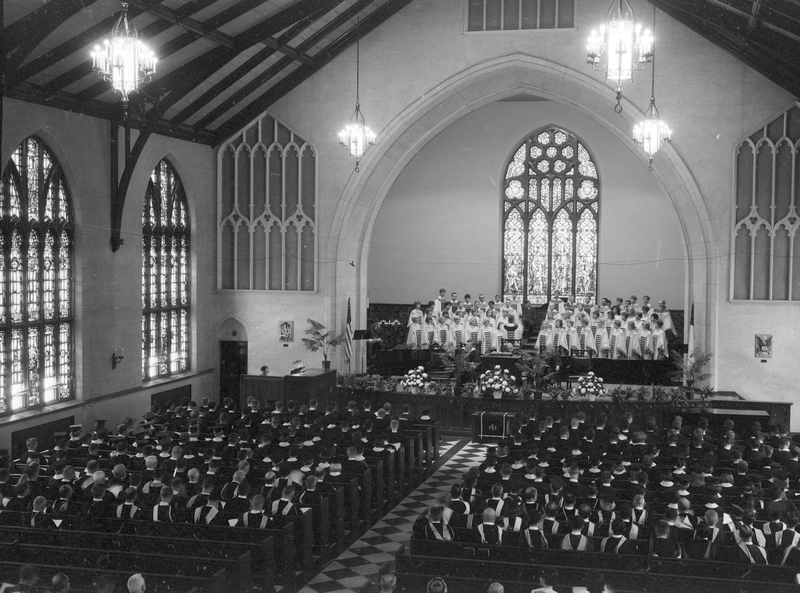 In another memory I have of my graduation in 1953, was that my education at HOPE prepared me for anything I chose to do. After my service in the Korean War, I went to the University of Michigan, where I spent seven years to complete my PhD, and went on to teach at Utah State University, Carnegie-Mellon University, and for 28 years at the University of Colorado. At 86, I still teach in a program for adults age 55 or older (OSHER) in an extension center for the University of California, Riverside. But HOPE got me ready for my journey!